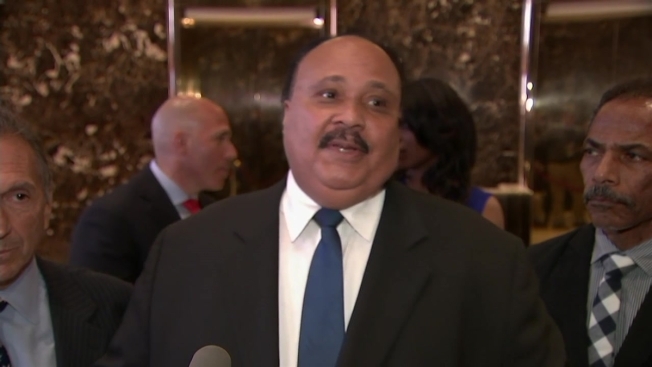 The son of Dr. Martin Luther King Jr. says he had a "very constructive" meeting with President-elect Donald Trump on the holiday marking King's life. Martin Luther King III played down Trump's recent claim that Rep. John Lewis, a civil rights icon, was "all talk." He told reporters at Trump Tower on Monday that in the heat of emotion, "a lot of things get said on both sides." King says the focus of his meeting with Trump was to improve voter participation and stress the need to bring America together. He says Trump assured him it's his intent to reach out to all Americans, even those who did not support him. Trump briefly appeared with King after their nearly hour-long meeting but ignored reporters' questions.